PowerPoint puzzle graphics for illustrations and presentations in PowerPoint. 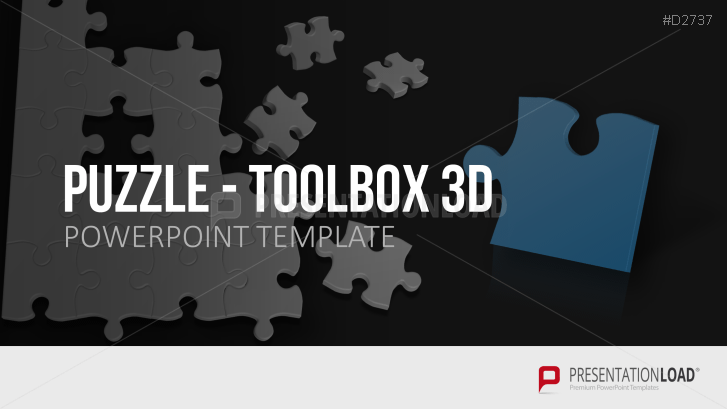 Toolbox includes over 100 puzzle graphics and designs as well as symbols, icons and silhouettes. A puzzle consists of many single elements that belong to a superordinate system and which, when put together, create one ensemble. In the end, it is how you put them together which generates the perfect result and guarantees a satisfying end product. Many little steps (pieces) enable you to approach your vision and to come closer to the desired result. Puzzle templates help you to illustrate these steps as well as the overall connected whole. This PowerPoint set includes over 100 slides that show various puzzle designs (such as separate or connected puzzle pieces) as well as bigger puzzled shapes (such as cubes and stairs). Individual puzzle graphics can be edited, filled in with text and images and offer various design options. Some graphics may also exclude particular pieces to illustrate missing pieces of a project or concept.